What percentage of my utility bill is caused by air conditioning ? It can be surprisingly small on an annual basis, but it depends on how much you use your air conditioning, how efficient your equipment is, and how much you conserve energy by actions ranging from insulating your home to keeping doors and windows closed when the system in operating. You local electric company is the best source for specifics in your area. How do I calculate the energy consumption of 1.5 TR air conditioner in a house? AC Operation of 8 hours a day, 252 days a year 75% compressor run time considered. This works out to 1,512 hours of operation per year, as found by BEE through one of their surveys. Please refer the Energy calculator on this site. Enhance effort to promote environmental protection initiatives through uasge of energy efficient product. How do I know if the AC I am buying is energy efficient? Ask for the EER (Energy Efficient Ratio) of the AC. The higher the EER, the more energy efficient the AC. Manufacturers publish equipment efficiency ratings which are available to your contractor. 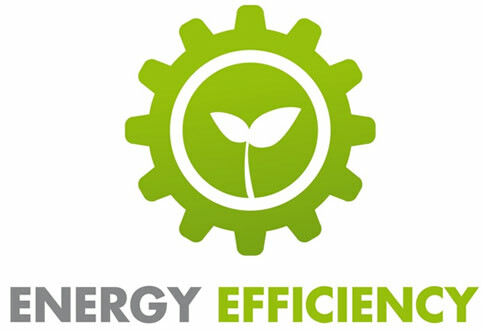 ARI also publishes directories indicating various energy efficiency ratings of specific equipment. It is important that a contractor install a unit that has just the right capacity to cool your home. Units with excess capacity will cycle on and off and work less efficiently, thus increasing your operating costs. How to get the most efficiency gains? How to Minimize Air Conditioner Cost? A well-maintained air conditioner is a more efficient unit. Schedule annual servicing with a local heating, ventilation and air conditioning specialist. He will replace the filter and to put your appliance though a full operational cycle. He can also check its efficiency and look for problems, such as blocked lines and poorly-insulated or air-leaking ducts. You should replace the filters more than once a year to keep the system running at its peak. Ask the HVAC specialist to show you how to change them and buy a few extras. YES! A new 13 SEER air conditioner or heat pump could save you as much as 50% on your operating cost of the system. 13 SEER is the minimum efficiency standard allowed by law. Depending on your current operating costs, high efficiency systems could save you even more. Newer gas furnaces are 30 - 40% more efficient than some older models. With rising gas prices, this could mean big savings. How to Compare Air Conditioner Efficiencies? You need neither air conditioning knowledge nor complex calculations to find the efficiency rating of an air conditioner. This information is listed on the yellow Energy Guide label required for all appliances. This label also gives you the estimated yearly operating cost of using the device, so you can translate the rating into real-world terms. Information is also available on the manufacturer’s websites. Look for the Energy Star designation on the yellow label, which means the product meets the energy efficiency guidelines demanded by the Environmental Protection Agency. Central air conditioners need a SEER of at least 14 to meet this standard. Room air conditioners need an EER that is close to 10. If I purchase a new heating and cooling system, will I be eligible for a tax break? Is it more economical to run a central AC unit with the fan always On or should you have the fan running in Auto? Not necessarily. I would caution you to watch the Relative Humidity in the Home. Depending on EACH system, the amount of moisture that lays in your drain pans is then put back into the conditioned space when you continuously circulate the fan. If you are in a tropical environment, this is not the most efficient way to operate your system. The home may actually "feel" warmer when the air conditioning comes back on. This effect is caused by the changing of moisture in your home. Moist air is lighter than dry air, so when you start the dehumidification the moisture rises. The removal of moisture is the biggest cost associated with the conditioning of the air. You be the judge, as you will notice whether you are cooler and saving in your electrical consumption. Why are rating numbers important? Rating numbers indicate the efficiency of heating and air conditioning equipment and are directly related to the amount of energy a specific model uses. The higher the rating, the more efficient the product, and the lower your heating and cooling bills can be. The federal government establishes rating guidelines and sets minimum efficiency levels. 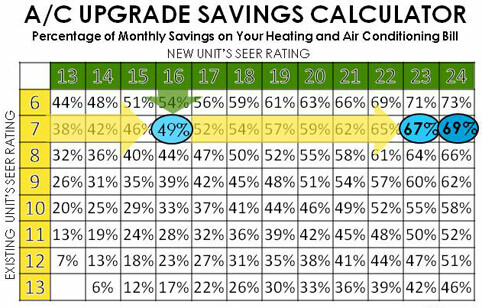 For cooling, the rating is SEER (Seasonal Energy Efficiency Ratio). For heat pumps, the rating is HSPF (Heating Seasonal Performance Factor). Gas furnaces are rated with AFUE (Annual Fuel Utilization Efficiency). Is it more economical to run the fan "On" always or should I have the fan set to Auto? If your current system is in need of replacement, your efficiency options are expanded and the potential for savings compared to your existing system can be quite dramatic. We can provide the consultation and information about all options and system combinations that might be right for your situation. How can I improve efficiency and save money? ENERGY STAR qualified central air conditioners have a higher seasonal efficiency rating (SEER) than standard models, which makes them about 14% more efficient than standard models. Though these products can be more expensive to purchase up front, the cost difference will be paid back over time through lower energy bills. You can also get better performance out of your cooling equipment by sealing your home and making sure your ducts don't leak. Is using ceiling fans and the air conditioner at the same time cost efficient or a waste of energy ? Ceiling fans are definitely not a waste of energy. Ceiling fans use very little electricity. Use them to circulate air in the house, to make the house feel cooler. By doing this, the thermostat setting for your air conditioner can be raised to 85°F, and still maintain the same comfort as the lower setting. .
Will the star rating increase the initial cost of ACs? In order to increase the energy efficiency, AC manufacturer needs to change the design parameters like increasing airflow, surface area of copper tubes and highly efficient compressor etc. These initiatives lead to increase in the initial cost of the star rated ACs. However, the life cycle cost (Running cost + initial cost) is substantially lesser than ACs that without star rating. Purchasing a 5 star AC can minimize your payback period. What is the comparative cost saving amongst different stars rated ACs? The cost saving between each star rating depends on the equipment running hours and electricity cost / KW. It is available on energy calculator. Energy calculator has the provisions for choosing a city and possible running hours. What are benifits of conserving energy? Energy labelling is a new way of allowing consumers to easily compare and rate the efficiency of air conditioners and systems, similar to that used for domestic appliances such as fridge's and air conditioner etc. If your current system is in need of replacement, your efficiency options are expanded and the potential for savings compared to your existing system can be quite dramatic. Horizon Services can provide the consultation and information about all options and system combinations that might be right for your situation. What are AFUE and EF? 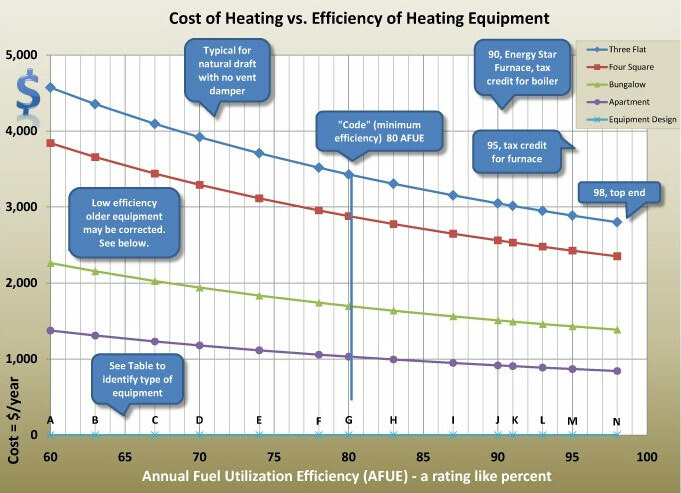 AFUE is the Annual Fuel Utilization Efficiency; the higher the AFUE rating, the more efficient the boiler or furnace. EF is the Energy Factor, a measure of the water heater's efficiency. The higher the EF rating, the more efficient the water heater. 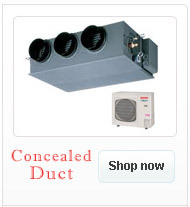 Ductless air conditioners save energy tips? In addition to the energy saving benefits provided by zoning, ductless air conditioners can circumvent all the energy losses associated with leaking ductwork. Losses from ductwork are some of the primary causes of inefficiency with central air conditioners, sometimes accounting for more than 30% of energy consumption – especially if ducts are in an unconditioned space such as the attic. BELOW IS AN EXAMPLE OF HOW TO SIZE THE UNIT. PLEASE MAKE AN INFORMED DECISION ONLY AFTER CONSUTING WITH YOUR HVCA CONTRACTOR. THIS DOCUMENT IS JUST FOR REFERENCE PUPOSE ONLY.